Former Home Affairs Minister under the People’s Progressive Party (PPP) administration, Ronald Gajraj, died at the Woodlands Hospital today after he was rushed there for medical attention. He passed away shortly after noon. He was 65. 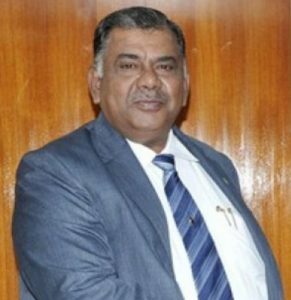 Gajraj served as Minister of Home Affairs from January 1999 to May 2005 under the Bharrat Jagdeo administration. He was forced to resign under local and foreign diplomatic pressure, particularly from the Americans due to allegations linking him to the activities of a terror gang known then as the ‘phantom squad’. He was later appointed Guyana’s High Commissioner to India and Bangladesh. Gajraj subsequently resigned from diplomatic service and returned to Guyana and where he kept a relatively low profile. BROOKLYN: The New York based Caribbean Guyana Institute for Democracy (CGID) has harshly rebuked Guyana’s APNU+AFC coalition government for failing to investigate hundreds of extrajudicial killings and political assassinations, which took place in Guyana between 2001 and 2015. The organization is calling on Caricom Heads of government, the United Nations and US lawmakers to intervene to ensure that a mechanism is established to investigate this dark period of Guyana’s history. The killings occurred under the coalition government’s predecessor People’s Progressive Party (PPP) regime, led by then President Bharrat Jagdeo. Jagdeo is now the country’s opposition leader. Transparency International had ranked Jagdeo’s administration as one of the most corrupt in the world. It is alleged that during Jagdeo’s regime, over 400 mainly Afro Guyanese men were systematically shot and killed by an alleged PPP affiliated gang known as the “Phantom” death squad. “The Phantom” was a murder for hire gang. CGID has insisted that these killings constitute “genocide” under international law. No one was ever held accountable. The APNU+AFC coalition, led by retired Guyana Defense Force Brigadier David Granger, won the 2015 general elections. It made the extrajudicial killings a central part of its general election campaign platform, and had promised an investigation and justice. Although Granger has been President for three years, an investigation has not materialized. In a letter to Caricom Chairman, Prime Minister of Jamaica, Andrew Holness, and other regional leaders, CGID President Rickford Burke fiercely criticized the Granger administration’s inaction. The missive was also dispatched to UN Secretary General, Antonio Guterres, United States Secretary of State Mike Pompeo and Members of the United States Congressional Black Caucasus. In a blistering statement Wednesday, CGID disclosed that letters to government officials and numerous public pleas for an investigation went completely unanswered. The institute accused the government of governing with “intransigence and audacious arrogance, as well as abandoning its campaign promises and electoral mandate.” It contended that “Sadly, there is a pervasive view among Guyanese that the coalition government has stopped governing in the interest of the people who elected it. It also questioned if the coalition is protecting an interest that is inimical to the wider Guyanese society. The Phantom gang was allegedly headed by US convicted drug kingpin, Roger Khan. An alleged financier of the PPP, Khan allegedly reported to then PPP Minister of national security, Ronald Gajraj. Leaked telephone records revealed that Khan’s mobile telephone number was in constant communication with Gajraj’s telephone numbers; particularly before and after most killings. Khan was arrested in 2006 by US federal agents in Paramaribo, Suriname and brought to the US where he was prosecuted in a New York federal court for exporting and distributing narcotics in the US. He was convicted in 2009 and is currently serving the tail-end of a 14 year sentence in a Florida federal prison. Gajraj was forced to resign after the United State government, under President George W. Bush, condemned his involvement in criminal activities. Jagdeo’s government granted Khan permission to import military surveillance equipment with triangulation capabilities. The Phantom gang allegedly used the equipment to locate and kill targets by tracking their mobile telephones. In 2002, officers conducting a joint military/Police sting operation arrested Khan in a vehicle with the equipment, which they confiscated. Subsequently, the Jagdeo administration, allegedly through then head of the Presidential Secretariat, Dr. Roger Luncheon, ordered law enforcement officials to release Khan and return the equipment. Publicly released US government cables show that then US Ambassador to Guyana, Roland Bullen, had advised Washington that Khan enjoyed the protection of the PPP government through Gajraj and Luncheon. The Ambassador also notified Washington of meetings with Gajraj’s successor Minister of Home Affairs, Gail Teixeira, from which he conceded that the PPP government was comfortable with Khan because “he was on their side.” A 2006 UN fact finding mission, headed by international human rights lawyer, Gay McDougall, also concluded that Jagdeo’s PPP regime was complicit in the murders. High profile assassinations included then agriculture minister, Sash Sawh, who became estranged from the PPP, journalist Ronald Waddell and APNU political activist, Courtney Crum Ewing. Crum Ewing was gunned down a few nights before the 2015 general election. Witnesses have identified the perpetrator as a known security guard with affiliation to a former high ranking PPP government official. CGID informed Caricom leaders that during Roger Khan’s trail in a Federal District Court in the Eastern District of New York, FBI informant, Selwyn Vaughn, testified that after journalist Ronald Waddell was gunned down outside his home, Khan, in his presence, telephoned then PPP minister of Health, Dr. Leslie Ransammy, and informed him that Waddell had been shot and is being taken to the Georgetown Hospital for which Ramsammy had ministerial responsibility. Vaughn testified that Khan instructed Ramsammy to let Waddell die. Waddell was subsequently pronounced dead. In a July 13, 2009, cable, then Charge d’Affairs at the US Embassy in Georgetown, Karen Williams, advised the US State Department that Ramsammy had strong links to Khan and as a consequence, the Embassy was reviewing its relationship with the Ministry of Health. The CGID letter said that “In unequivocal terms, there is conclusive evidence implicating or connecting at least five former PPP government officials to the Phantom death squad, which murdered hundreds of Guyanese citizens. Nonetheless, there has been no investigation. These individuals, two of whom are current opposition Members of Parliament, still live in luxury, while the victims” families still mourn and await justice. The institute posited that this state of affairs is abominable and unacceptable. “The lives of these Guyanese citizens matter. We will wage a relentlessly fight for justice. inewsWe will begin to confront coalition government officials in Guyana and abroad, and urge all Guyanese at home and abroad to do the same. We will not rest until there is justice. If needs be, CGID is prepared to take this fight all the way to the 2020 general election,” the CGID statement added.